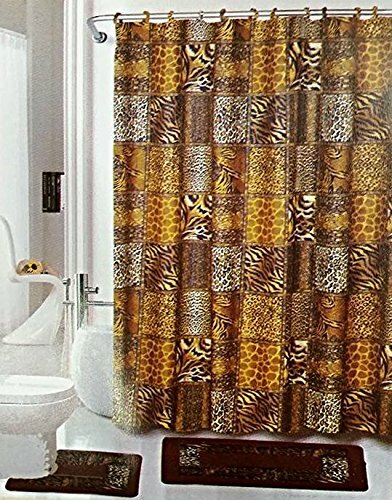 Safari 15-Piece Bathroom Set Brown Bath Rugs Shower Curtain & Rings by EMPIRE at Animal Backgrounds. Hurry! Limited time offer. Offer valid only while supplies last. Complete 15-Piece Bathroom Set. The Bath Designer Collection includes a bath mat, contour mat, shower curtain and 12 matching shower curtain rings. Complete 15-Piece Bathroom Set. The Bath Designer Collection includes a bath mat, contour mat, shower curtain and 12 matching shower curtain rings. This collection provides everything you need for a well decorated bathroom.